It’s been a good while since I’ve placed a bet. Japan’s strict gambling laws rule out the possibility of a drunken 3am sojourn to the local casino, and I’m neither old enough or clued up enough to play pachinko. Besides, I quite like my eardrums intact so won’t be heading there any time soon. The Saturday routine of a hangover breakfast in Wetherspoon’s followed by a quick visit to the bookies to waste a few quid before heading to the Dale game is well and truly lacking in Japan. Granted I work Saturdays, and Rochdale play in Rochdale – not Tokyo – but you get my point. Gambling in Japan is rare. I’d seen advertisements for the Japan Cup on the Keio line for weeks in advance but to be honest it had never crossed my mind to actually look into going. I assumed it was the Japanese equivalent of the Grand National considering the amount of adverts and fuss there was, so I suspected it would be a) expensive and b) sold out. It was only when my colleague Glen (who you may remember from a few weeks ago!) sent me a message the day before to suggest going. I was plied with the promise of free train tickets from his student and an opportunity to drink and waste money. It doesn’t take much. 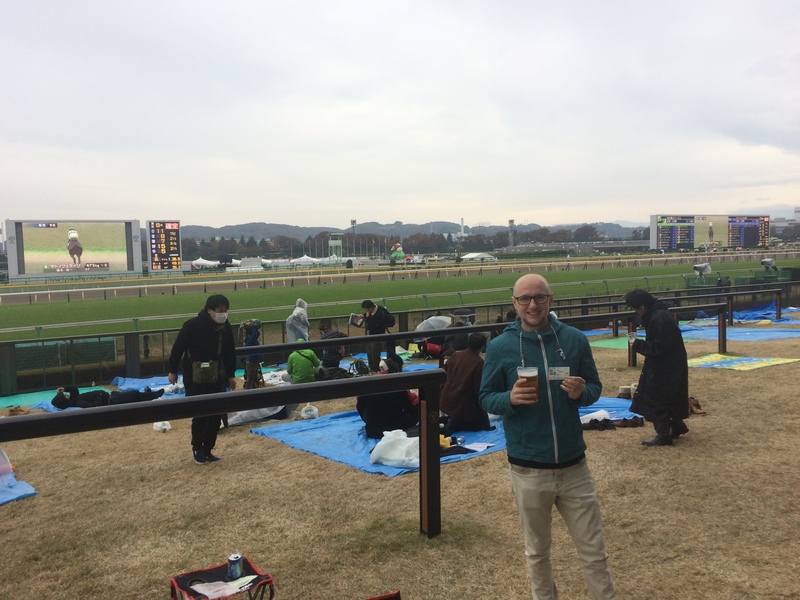 A mixture of a good lie in, a slight hangover and a lack of food in the house meant that eating was a priority upon arrival at Tokyo Racecourse in Fuchu. 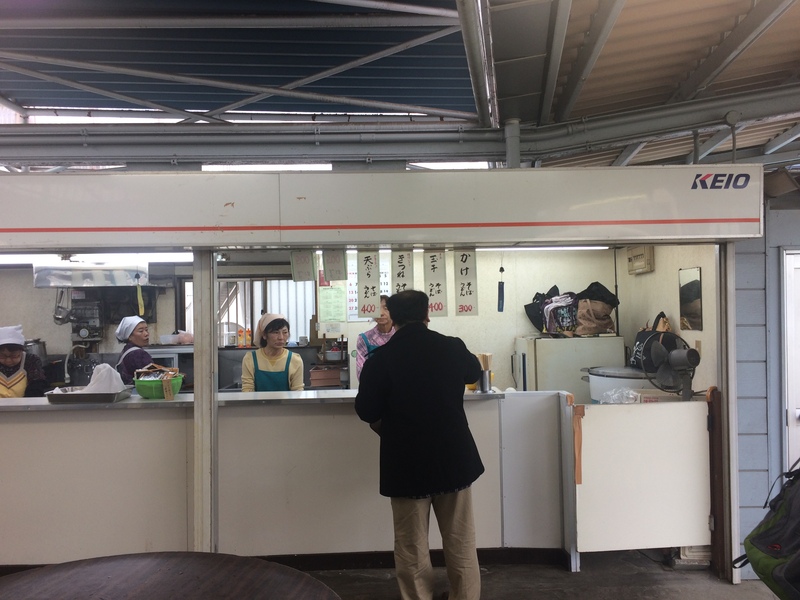 Thankfully at the station there was a small canteen more reminiscent of countries such as Thailand and Vietnam serving bowls of udon and soba noodles for ¥300 or so. A glistening light at the end of the tunnel (track). 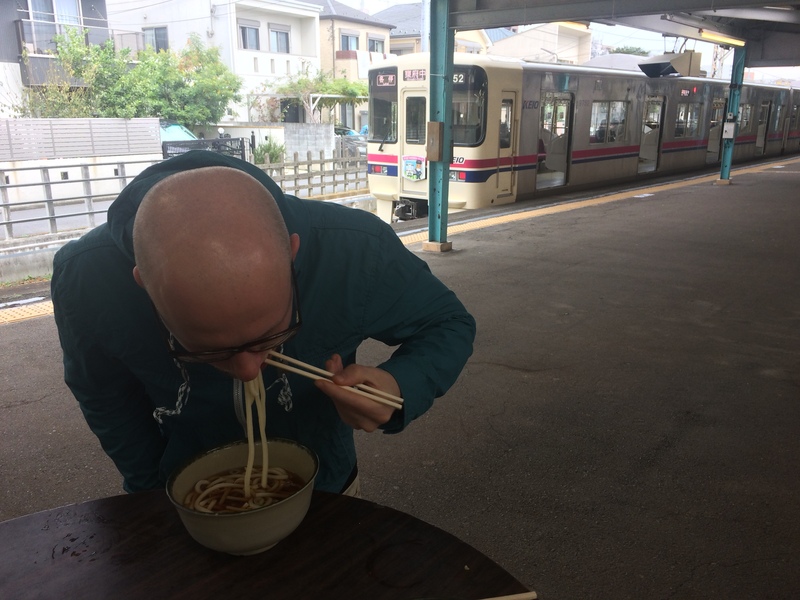 I’m not sure standing up and bending over a table (minds out of the gutter people) whilst slurping noodles is good for your back, or indeed any light coloured clothing but at this point I’d have eaten anything in any manner possible. Customer service in Japan can often feel false as you’re greeted with a chorus of “IRRASHAIMASE” whenever you walk in anywhere. The members of staff often look dead behind the eyes and as if they’re reading a script, but the ladies running this stall seemed genuinely happy to be at work and were surprisingly impressed with our very basic Japanese upon ordering! A very nice surprise indeed! There’s only so graceful you can be when you’re slurping noodles. With hunger staved off (at least temporarily) we decided to make our way to the racecourse. The walk to the entrance was somewhat reminiscent of Wembley Way, although that’s probably not a very clear image in my head considering the state I was in that day. As is the case everywhere in Japan many people were stopping and posing for pictures with a statue and just about any sign or poster in the area. This time it was a big gold horse that was attracting the most attention which I imagine looked like just about every other statue of any horse ever. Neither of us had a clue what was so special about the horse but as I’ve said many a time on here in the past: if you can’t beat ‘em, join ‘em! 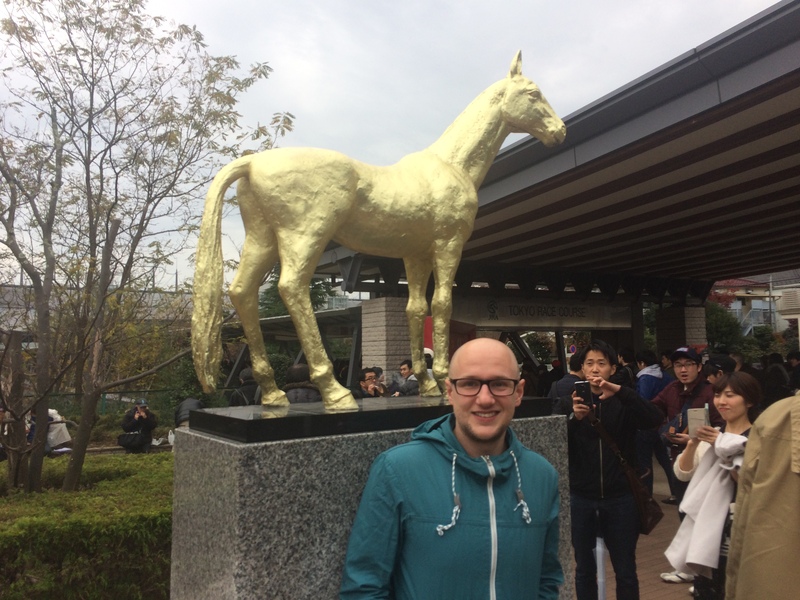 I have no idea why this horse is immortalised in a gold statue, but if everyone else is taking photos I’ll be damned if I’m missing out! Anyone who’s been to the races in England will know that it’s often a big day out in every sense. The extravagant/formal dress code, big money getting thrown about and – of course – you pay anywhere upwards of about £30 for a ticket. 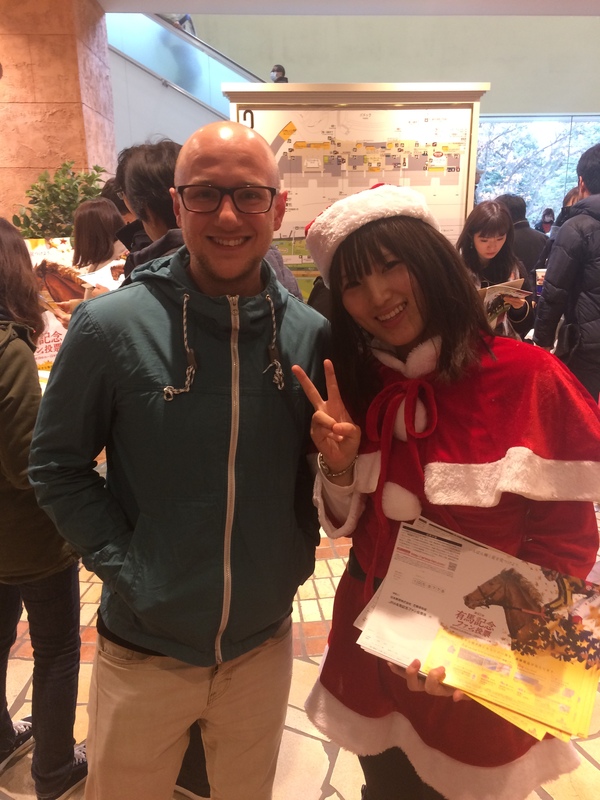 The Japan Cup is different in almost every sense – we rocked up in the most casual clothes possible (which included a couple of fleeces for Glen who seemed to think we’d be climbing a mountain of sorts!) and, perhaps more surprisingly, we got into the race course for ¥200. That’s about £1.40 with the current exchange rate! With ticket prices like that you’d be forgiven for thinking the track and facilities would be a bit of a dump and I was expecting the worst but, to my surprise, the complete opposite was true! The whole place seemed to be brand spanking new! Any fears of being underdressed were also confirmed when I bumped into this familiar character. Santa at the races because…Japan. We arrived halfway through a race, so had to wait until the 9th race of the day (or the weekend, I couldn’t figure it out) before getting in on the gambling action. As is so often the case in Japan human interaction was shunned in favour of technology as all bets were placed via a machine. A great idea when it comes to saving money on wages, but not so good when you don’t have a clue how to place your bet! Thankfully with a little help from Google I figured it out and it was pretty straightforward from then on. 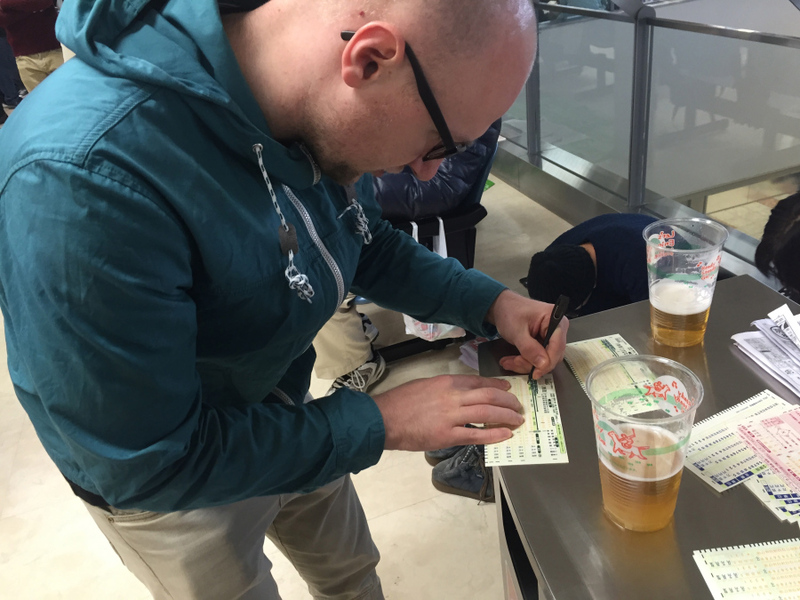 We weren’t betting mega bucks as we couldn’t read any of the information about the horses so it was more a case of picking a random number or deciding which katakana name we liked best! 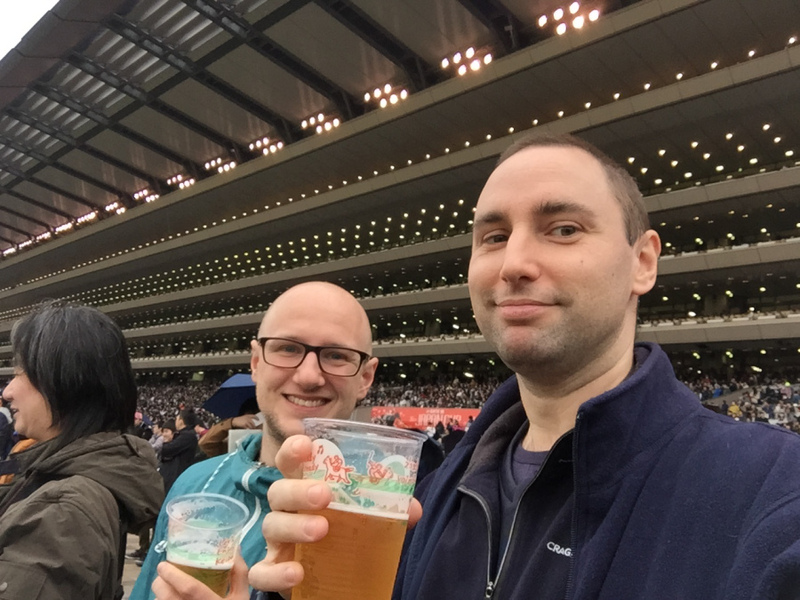 After placing our bets it was time to get a reasonably priced ¥570 beer and take shelter from the rain whilst hopefully watching our horses romp home! On the way to splashing some cash thanks to Google Sensei! For the first race I put ¥500 on Rinrio as it was one of the few katakana names I could read (I was tired and a little hungover, cut me some slack) and it came 4th. Not bad, but not enough to win me some brass. Next up was Metal Dahl (not a clue) which came in 3rd; getting closer, but still no cigar! With the first two horses coming in 4th and 3rd I decided to lump ¥1000 on the last race and pick two horses in the hope of the pattern continuing and ending with a 1st place finish! I went for the odds-on favourite Kitasan Black, and the less-fancied Sounds of Japan. With regards to the latter I have absolutely no idea where it finished as I was too busy watching Kitasan Black storm to victory. ¥500 well spent! Sadly there was no such luck for Glen as his horses were nowhere to be seen. In hindsight though this was actually a good thing as he somehow managed to lose his betting slip in between placing the bet and the race starting! All that remained was for him to watch me collect my winnings – from a machine, naturally – before heading back to the station and into the city for some food. More on that later! After four bets placed at ¥500 each I came away with ¥1900 winnings, which the mathematicians amongst you will have already noticed is a ¥100 loss. Still, it’s the taking part that counts isn’t it?